You can imagine how excited we were when women's dungarees came back into style. 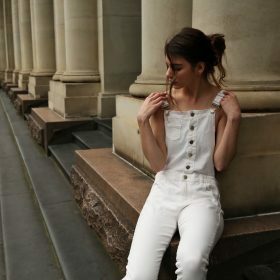 Women's dungarees are the absolutely perfect solution for when you have zero styling inspiration. It's so simple, so easy: just grab your dungarees, wear it with a long sleeved shirt and a pair of mules. Add a few bits of jewellery to dress up your look. To make sure you'll find the perfect pair of women's dungarees you can use our filters below. Colours, materials, brands and shops; browse them to find your perfect pair!